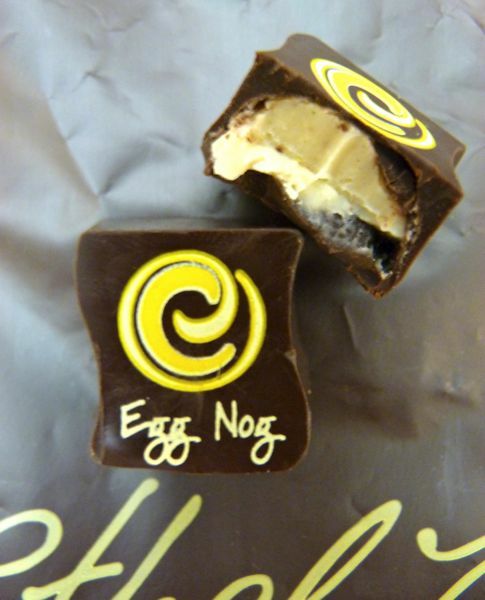 'Tis the week to polish off holiday chocolates -- such as this Egg Nog truffle from Ethel M Chocolates (Henderson, NV). If you're visiting Las Vegas, you can drop by the Ethel M factory shop (and cactus garden that is colorfully decorated with inflatable snowmen and Christmas characters during the holidays). However, even if you're just changing planes at McCarran International Airport (LAS), you can also stop by the company's shop(s) in the airport. 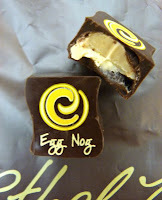 This Egg Nog chocolate had a smooth texture, and an authentic eggnog taste, with a nutmeg-inflected white chocolate/flavored cream style filling.